That's right, I just called a key awesome. Seriously. 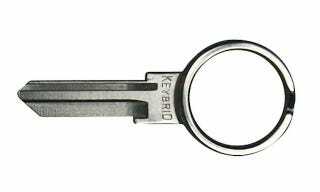 The Keybrid key-plus-keychain is so cleverly designed that it'll make you furious you didn't think of it first. But calm down! We've got a Gizmodo reader discount that'll cheer you up. You see that chunky, old and busted keychain of yours? The one that's been jangling around in your pocket since college (or worse)? I've got one too. But we don't need 'em—the Keybrid, configurable at any hardware store, has its own keychain loop built in, and is available in either KW1 or SC1 formats—which covers 90% of American residential locks. This thing is meta! Strap keys into another key! Don't let it boggle your mind. Or if you're looking to head out of the house packing extra light, slip some cash or a card into the loop and leave the wallet at home.